He has guided Everton to ninth in the Premier League after taking 27 points from 20 games since replacing the sacked Ronald Koeman. However, there has been growing discontent among some supporters over what they perceive as a negative playing style. 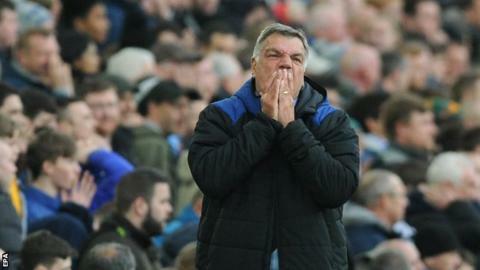 Allardyce suffered abuse from supporters during and after Saturday's 1-1 draw at Swansea City, having been subjected to similar treatment after the defeat at Burnley on 3 March. What next for Everton and Allardyce under Moshiri? Speculation surrounds Allardyce's future and there are suggestions owner Farhad Moshiri is contemplating a summer managerial change. Former Watford boss Marco Silva - Moshiri's first choice after Koeman was sacked last October - is now available after his dismissal at Vicarage Road and Shakhtar Donetsk's Portuguese coach Paulo Fonseca has also been linked with the post. PSV Eindhoven's sporting director Marcel Brands is to give a decision soon on whether he will move to Everton, which would call into question the future of director of football Steve Walsh. Everton send out a fan survey several times a year. The club sent the same list of questions to some fans last May, including one out about their view on Koeman. The latest one also asks supporters to rate their level of trust in players being "loyal and performing at their best", and the club's senior leadership team. There are questions too about how Everton are portrayed in the media and on the overall direction of the club. Former Everton defender Alan Stubbs said it is "disrespectful" for the club to ask supporters to mark Allardyce in a survey. "I'm very surprised by it," said the former Toffees centre-back. "I don't think it is good in the sense that there is only going to be one answer and it is not going to be positive. "There is no denying it, there is an element of Everton fans, and it is growing, that would not like to see Sam there next year. "I really feel sorry for Sam and his staff that they are having to deal with this in the public. "They asked for the fans' opinion on the new stadium and how they want it built, which I think is great. But in terms of asking about a manager, I think that is very disrespectful. "I feel sorry for him. He has come in and did the job that he was expected to do."